Garcia & Vega Cigar Co.
Garcia & Vega Cigar Co. was founded in New York in 1882 as Garcia & Gonzalez Cigar Co. by Asturian immigrant Alvaro Garcia Longo (1854-1921). In 1884 also Asturian immigrant from Arriondas José Vega (1860- ) became a partner and the firm name was changed to Garcia & Vega Cigar Co. In 1895 Pantaleón Félix Carcaba was added as a third partne and the firm name was changed to Garcia, Vega & Carcaba Cigar Co. In 1906 upon the sudden death of Carcaba the name was changed back to Garcia & Vega. They owned the Austino, El Mas Noble, La Flor de Alvaro Garcia Longo, Garcia y Vega, La Rosa de Mayo, Duquesita, La Perla Española, Flor de Garcia y Vega and Flor de P. F. Carcaba brands. 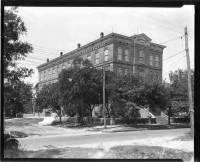 According to the Hillsborough County Property Appraiser, this 60,180 square foot building was built in 1908. The inscription on the building states "1882 Garcia & Vega The Bonded Havana Cigar", which is the year the company was established, not the year the building was constructed. 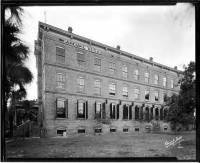 The state first granted the land to Antonio Perria before West Tampa was established by John H. Drew on March 10, 1884, then sold to Garcia and Vega in 1907. In 1962 Bayuk Cigars Inc., a Philadelphia based company establsihed in 1896 as Bayuk Bros., bought the Garcia & Vega brand, at the time holder of the largest stocks of pre-embargo Cuban tobacco already in the U.S. On June 16, 1971 Bayuk Cigars Inc., represented by its President E. Archie Mishkin, sold the building to Villazón Cigar Co., Inc. and in 1982 sold the the Garcia & Vega name to General Cigar. Villazón Cigar Co., whose brands included Villa de Cuba, El Cerdo, Villazón, La Docilla, Punch and Hoyo de Monterrey, was the result of the reorganization of the bankrupt José Arango Company. Soon after acquiring the building, Villazón's main shareholders Frank Llaneza (1920-2010) and Tino Gonzalez (1917-2012), the grandfather of well known baseball player Tino Martinez , who had worked at Garcia & Vega since the 1940's, moved Villazón here from Ybor City. In 1997 General Cigar acquired Villazon Cigar Co. brands for $91 million. On April 10, 2001 Villazón Cigar Co. sold the building to Angel Oliva Jr. and John E. Oliva Sr. who soon therafter transferred title to Oliva-Armenia LLC, its current owner. The building is currently occupied by the Oliva Tobacco Company , a well known supplier of high quality tobacco to many major cigar manufacturers, the Garcia & Vega name still can be seen on the building's parapet. This link provides for interesting reading of a Cigar Aficionado interview with Frank Llaneza in 1999.